The mysterious sailor of Duke Street. | Come Here To Me! The mysterious sailor of Duke Street. 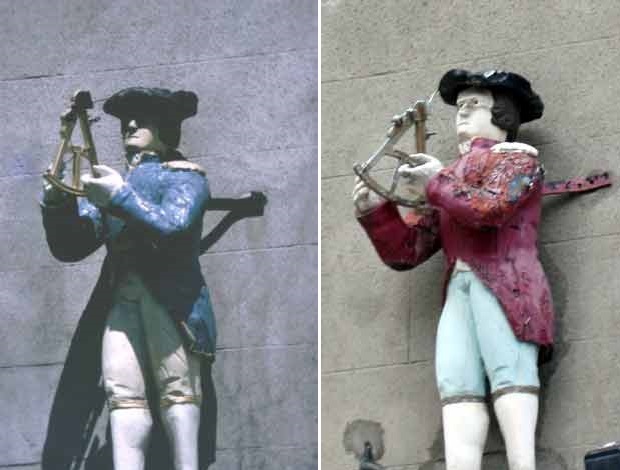 Standing over The Bailey pub on Duke Street, and now between the windows of an upper-floor of Marks and Spencers, this lonely sailor with a sextant in hand has been baffling me for years. Let us pause a few moments in Duke Street and gaze at the trim little figure of Captain Cuttle in his three-cornered hat, gold-frogged blue tail-coat and cream breeches, as he stands shooting the sun with his old-fashioned brass quadrant…..When Dickens was driving to the rotunda to deliver one of his readings he climbed down from his car and came into the shop to inquire about the figure. In recent years, there have been a number of blogs and publications dedicated to the celebration and chronicling of Dublin’s ghost signs, the reminders of the city in generations past. 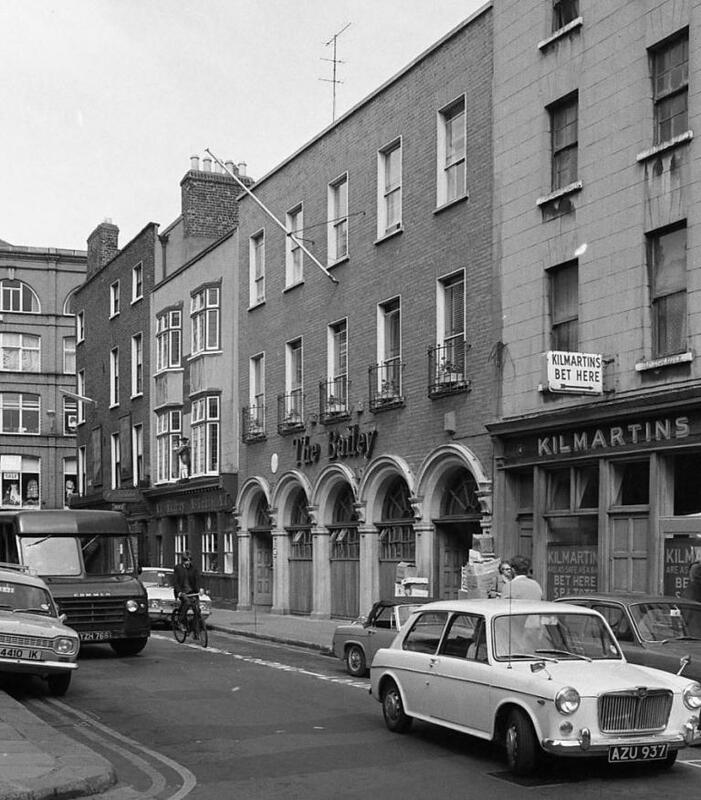 In a review of Antonia Hart’s study of ghost signs, Dermot Bolger wrote in the Evening Herald that “This mariner first appeared above a shop in Capel Street in 1810, before he and his owner – the optician, Richard Spears, whose services the quadrant hinted at – moved to College Green”. The Bailey, Duke Street, 1970. Before its modern expansion. Image from Dublin City Council Photographic Collection. The name of Richard Spears pops up in Wilson’s Dublin Directory for 1801 on Capel Street, where he was listed as a “mathematical instrument maker” at number 23. Spears,it seems, later took up premises at 27 and 35 College Green, before going into partnership with Edward Clarke from 1815-1817. Some of his handiwork, signed , “R.Spears, instrument Maker to His Majesty’s Crown of Customs in Ireland”, can be seen here. These items are in the collection of the National Museum today. Pat Liddy, expert on all things Dublin from the time of the Norse to the present day, has written that “the venerable old sailor” kept watch over Murray McGrath’s for many years, writing that “John Murray…found the statue on a quay dump, retrieved it and brought the partly rotting plaster cast to a statue maker or restoration.” Murray McGrath’s optician operated on Duke Street for a long time, and in the 1960s our friend Pól Ó Duibhir snapped the sailor there. His coat was pink and peeling. He was looking at the sextant in his hands as if he didn’t know whether to play it, eat it, or poke somebody’s eye out with it. He was reduced in stature and had clearly put on a bit of weight – puppy fat maybe. He had lost his bearing as well as his bearings. He knew not whence he came or where the hell he was going. And it didn’t really seem to matter. Nothing was expected of him. So, I’m curious – what’s the deal here? How long has the statue on Duke Street been there? It’d be great if someone can clear it up. Next time you’re passing by, have a look up at him. Thanks lads, you’re doing me proud. I was aware of the Capel Street link to Captain Cuttle alright, think I came across it in the same article in the Dublin Historical Record. There is also another reference to him from an old lady who recalls standing on a balcony above him awaiting the procession of King George (I think), and dropping gooseberries into the ladies bonnets on the street below. I imagine this must refer to the Captain’s former address in Capel Street as a majot thoroughfare in the early nineteenth century. Love the 1970s photo of the Bailey, a far cry from its present elaborate appearance! Just read that article which my son sent me…My husband John Murray O Keeffe was the optician and owner of Murray Mc Grath.for 47 years. 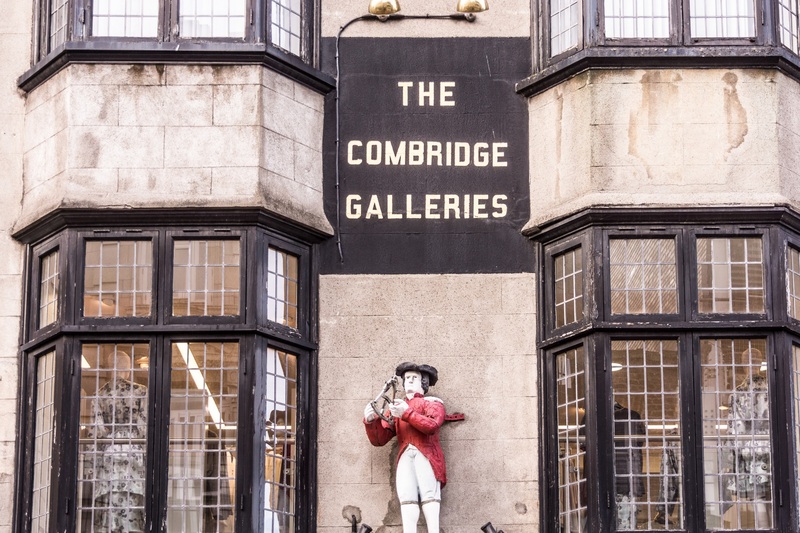 the “little man” as we all called him had been taken down after premises was sold to Marks Spencers….I have inquired several times as to where it is….mystery…. we as a family of Opticians would love to find it as it was my husbands uncle who found it and got it restored where it had been over Murray Mc Graths for a very long time.